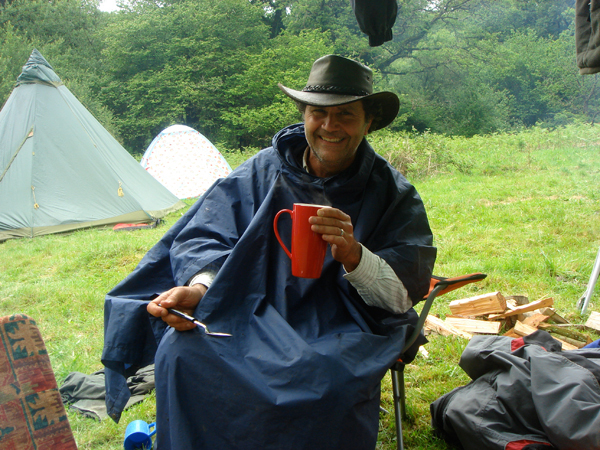 We caught Lawrence mugging while camping out at a gathering in the UK. I was born in 1958 in the eastern suburbs of Cleveland, Ohio and my sister Karen arrived a year and a half later. My father Terry was (and still is) a dentist. In those days, my mother Phyllis stayed at home full-time to be a housewife and mother. An important influence in my childhood was my maternal grandfather, Charles Sugerman. ‘Grandpa Charlie’ was born in Lithuania and immigrated with his family at the age of nine. Charlie was short, stocky, and outspoken. His greatest love was horse-back riding, and throughout my early childhood, I spent time with him riding horses, grooming them, and just hanging out at the farm where he boarded his horses. Around 1970, Charlie decided to buy his own farm. Soon the farm grew into a major operation with 100 head of beef cattle, chickens, pigs and fields planted in oats and hay. For a kid from the suburbs, working on a full-fledged farm was like paradise! I loved being outside with the animals and doing hard physical labor. I learned to drive a tractor, grind feed, and care for the livestock. In early September of 1971, I had a Bar Mitzvah. This Jewish rite of passage was done more to appease my grandparents than out of any sense of personal devotion. Three weeks later, I was out at Charlie's farm riding on the back of a tractor while one of the hired hands named Kenny was cutting alfalfa. At one point, I jumped off the tractor to clean the cutting blade. As I climbed back on, Kenny turned on the power take-off to the cutters a bit too soon. My boot lace got caught in the whirling universal joint, and in a few seconds, the lower part of my left leg was torn wide open. Riding in the ambulance, I remember feeling a profound sense of surrender: Not knowing whether I might live or die or possibly be disabled for life. Yet somehow I felt a great peace. After plastic surgery, a month in the hospital to recover, and another few weeks in a cast, I was fortunate to walk again. Only many years later did I learn that in many traditions, initiation involves some form of “wounding” and this rite is presided over by elders. In some strange way, the largely symbolic rite of passage of my Bar Mitzvah had been eclipsed by something much more profound for me. And it came loosely, unwittingly, via my grandfather. Whatever this initiatory-like experience of the farm accident portended, for many years it remained a mystery. Whereas my maternal grandfather gave me a connection to the land, my father’s side of the family was full of doctors, lawyers and dentists. It seemed inevitable that I would become a professional. I graduated from college, worked on Capitol Hill in Washington for a few years, and did a stint in the Peace Corps in Sri Lanka before moving to California. Eventually I entered a new graduate program in international relations at U.C. San Diego. By far the best thing about those years in graduate school was meeting Jessica De la O, who would eventually become my wife! Jessica was raised Catholic in an assimilated, Mexican-American family. Perhaps more than most others in her family, she felt a yearning to connect with her Mexican roots. It was not so obvious at the time, but now it is clear that we were meant to help one another find our way to our deeper calling. Both Jessica and I began to see our future in academia. We moved to Santa Barbara to pursue our Ph.D.’s in education. Sensibly, Jessica suggested that we needed something to balance the intense intellectual focus of our graduate school. And so we started a regular meditation practice. That opened up completely new possibilities for us. During this period, I read a magazine article about Eliot Cowan and Plant Spirit Medicine. I was immediately intrigued. "Coincidentally," Eliot lived in Santa Barbara, and reading the local paper one day, I discovered that he was offering a public talk. Jessica and I decided to go and hear directly from this odd fellow who purported to communicate with the spirits of plants! After many years, I have come to see how Divine often uses such synchronicities to help us find our way. Meeting Eliot was one of those pivotal moments. When Eliot spoke about the fundamental imbalance in our modern way of life, his words were so stark and compelling. It was as though he was speaking directly to our hearts. I immediately signed up for Plant Spirit Medicine treatments with Eliot and Jessica soon followed. Within a few years, I decided to study plant spirit medicine myself. Shortly after making this commitment, I had a series of strange and powerful dreams. Eliot helped me to understand that these dreams represented a calling to become a marakame or healer and ritual leader in the Huichol tradition. Since that time, our lives have become a rich and often challenging adventure. We discovered that all of Eliot’s work—both Plant Spirit Medicine and the Huichol shamanic path—were gifts from the God of Fire who is known as Tatewarí (Grandfather Fire) in the Huichol tradition. Following Eliot, we became servants of Tatewarí. Like Eliot’s other students from around the world, we began holding monthly community fire gatherings and we were eventually initiated as Firekeepers. Community fires are supported by an organization that Tatewarí launched called the Sacred Fire Community. The purpose of that organization is to bring more heart into an otherwise cold world. For eight years, I served as one of the Co-Executive Directors of the Sacred Fire Community organization. Also during this time, after six years of pilgrimage, I was initiated as a marakame in 2004. Despite all of the years of academic training, it seems that the land and the ancestors finally won out. Although Jessica and I have done a fair bit of moving over the past few years, we have a new-found sense of home. Wherever we are, sitting by the fire helps us to feel rooted. We are blessed to join many people around the world who are doing the work of heart and Fire. We have found a calling that involves healing and community building. Nothing gives us greater joy than sharing that work!